Not my best blog post title, I know, but it will have to do. Last May (2013) really was pretty fun. This May of 2014 was too, but I'll get to that next week. First I want to finish up the Chronicles of May 2013. We went to a circus. It was no Wringling Brothers or Barnum & Bailey, but it was fun. John and I rode on one of my favorite animals, an elephant. I'd never done that before, but it was his second time doing it. John also got to ride on a camel. The tigers were beautiful...and hot. It was a very warm day. My animal rights antenna goes up with things like circuses. I want to believe that the animals are treated well and that they have a good life, and I think that in many cases they do, but I don't think it's an ideal life for them. They're not in their natural habitat; they're basically living in captivity...but hopefully a "fun" captivity? And there are too many cases of mistreatment and abuse, unfortunately. I try to make myself feel better by telling myself that it doesn't happen to most of them, and that they're happy and live a more secure life than they would in the wild, but overall it just doesn't sit quite right with me. But I guess it sits right enough because I still go to circuses, just with a bit of guilt, misgiving, and concern. The camels were cool. One of them ran off into the field during their performance, which I thought was pretty funny. I loved the elephants. They are so intelligent and powerful, yet gentle and sweet. This picture isn't the greatest, but I wanted to include it because this guy was John's favorite. He spun a bunch of vases around on his head. They increased in size, and the final one was really big. It was pretty impressive. 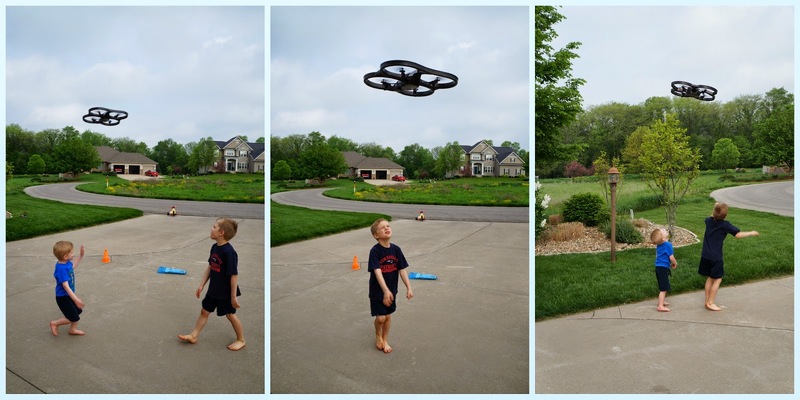 Peter got a remote-controlled drone and had fun flying it around. The kids had a blast chasing it. The drone worked a couple of times before sustaining some major injuries in a big crash. (Good job Peter! Ha ha.) It's been sitting in the garage, broken and unused, ever since. In fact, it's on Peter's To-Do List this month to either fix it or trash it. The sad things that become of our toys! The boys got new toys too, for the last day of school, and fortunately a year later, these are still working just fine. They'd been wanting power cars like their grandparents have in their backyard, and we've got the yard and garage space for them, so why not? I would have loved driving one of these around when I was a kid, so it's fun to be able to see my kids do it. There's nothing like living vicariously through your kids, after all! John was really mad to find out that the Coop actually goes faster than the Escalade does. Hee hee. And this picture is just sweet, of the boys sharing a bottle of Gatorade on a hot day. Look at their hands! I love that they are brothers and I love that they are my sons. If we have no more kids, they are more than enough for me and for us. We are blessed! And that concludes the late but not completely irrelevant Chronicles of May 2013!